Sage Egger Harless is a native of the Jackson metro area. She received her law degree from Tulane University Law School, and her undergraduate degree from the University of Mississippi. 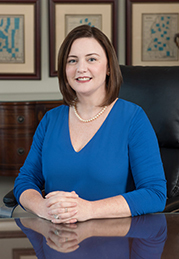 After law school, Sage served for several years at the Mississippi Supreme Court as a judicial law clerk to Presiding Justice Oliver E. Diaz, Jr. and Justice James W. Kitchens. Sage is licensed in Mississippi and Louisiana.